Beautiful and but extremely cold - especially with no heating as the oil had run out! Twelfth Night and the decorations come down, always a sad day especially after the magical week of Christmas and New Year. Belated Happy Christmas to you all. Christmas once again brought the garden indoors with Allium heads sprayed red up the stairs and Honesty seeds in the drawing room. We had cut some of the magnificent crop of holly berries in November and their red and green hue was echoed in the dining room decorations. Our beautiful Christmas tree came from our favourite local Nursery Garden, conveniently situated over the river in Child Okeford. Oasis Plant Centre comes to our rescue many times a year, always having the perfect plant for a bare patch in the borders - 01258-861-325 - and there is the additional joy of finding Peake Perennials on the same site - Tel: 07708 872918 - who have some very specialist plants. We returned from Cornwall to find the storm over the weekend had flooded the cellar, the boiler was out and one of our new olive trees had blown over. 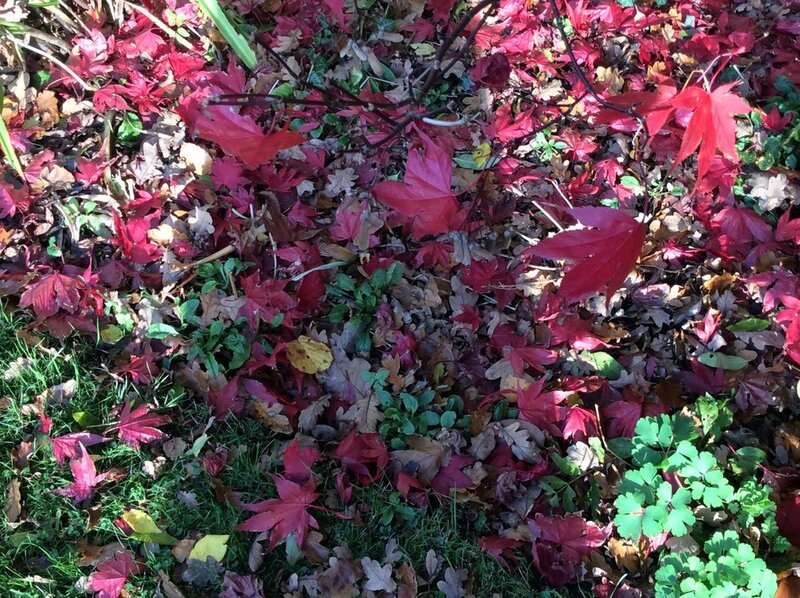 However, the wonderful Autumn colours that had come to life since we left compensated for everything. First serious frost but all safely gathered in. So beautiful as the sun rose. And then when the sun came up and melted some of the frost on the lawns. The most incredible sunset lit up the sky last week - sadly the ipad did not pick up the intensity of the red but still very beautiful and a sign of the sunny day to follow. Frantic work on Friday to get all the tender plants into the greenhouse before the first frost of the season. Rushed in from the garden to take photographs of the most incredible double rainbow. Sadly could not get the whole arc in one shot. 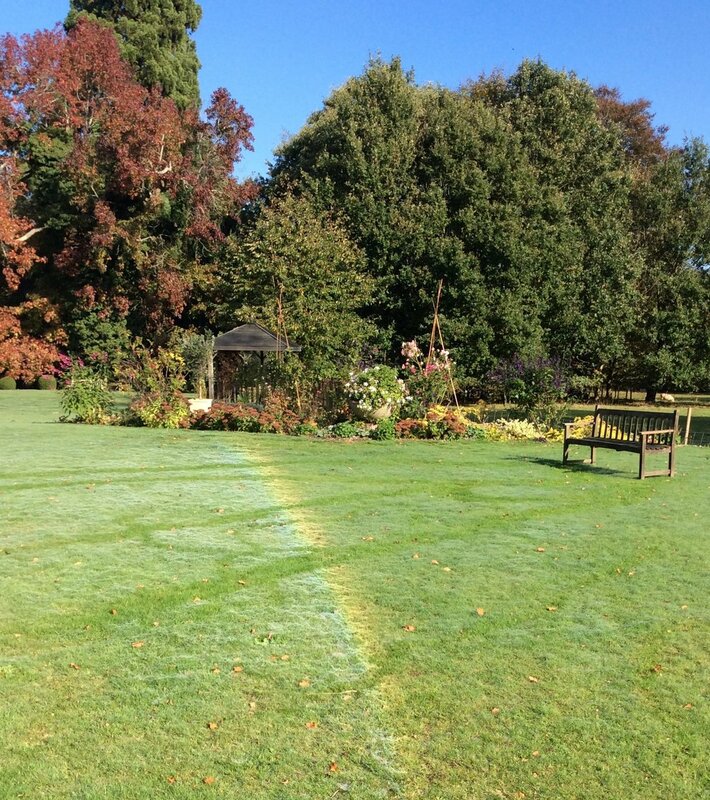 Edging the rose beds, I suddenly noticed the most beautiful rainbow glistening in the dew on the grass. Our Bramley apple tree was laden this year. We were able to send some to the Food Bank, local Children’s Centre and the United Churches in Blandford who cook free lunches during half term and holidays as well as giving them to friends and storing some for ourselves! Plus we had enough to make apple juice at our village pressing session when a lovely lady opens her house and equipment to anyone with apples to press. It results in many bottles of delicious juice, much stickiness and much fun. Pumpkins of every size and shape coming in to be stored for the winter with the added bonus of some edible lawyer’s wigs amongst them. We have had our last wedding of the year - an incredible Steam Fair Wedding - story about to be posted. Now the garden needs to be put to bed, with Jean and George our wonderful gardeners working really hard - roses pruned, long grass cut and fragile plants taken in to safety before the first frosts. The garden continues to grow with the yuccas outside the stables sending up the most amazing flowers. The spiders have also been busy! Their webs are so beautiful with the sun on the early morning dew. They came in July and it was a wonderful experience - it was fascinating being able to watch how the shoot developped from the original ideas. We have had to keep the photographs under wraps but can now share some of them with you. The blog has some in-house pictures too but marked with a dot. Emma had suggested that we use our summer house for one of the tableaux and she created in seconds a stunning pillar of flowers up one side. She had sourced many of her flowers from our local trail way and even a few weeds from Lidl's car park - this foraged look is why Mariel sort her out. She also made a beautiful tied bouquet for the bride to carry. The sun was still too high to take photographs in much of the garden so Mariel and Abe started with the summer house shots where the sun coming in at an angle was perfect. In the heatwave, Shillingstone House was surrounded by browned grass and scorched flowers, not the green grass and cow parsley that Mariel had originally wanted but she really embraced the surroundings. I will never look at our long grass in the same way again! And now for the amazing photographs that they took. When Mariel suggested using an apple tree in the shoot, our's only had tiny apples on it but on the day it was perfect. 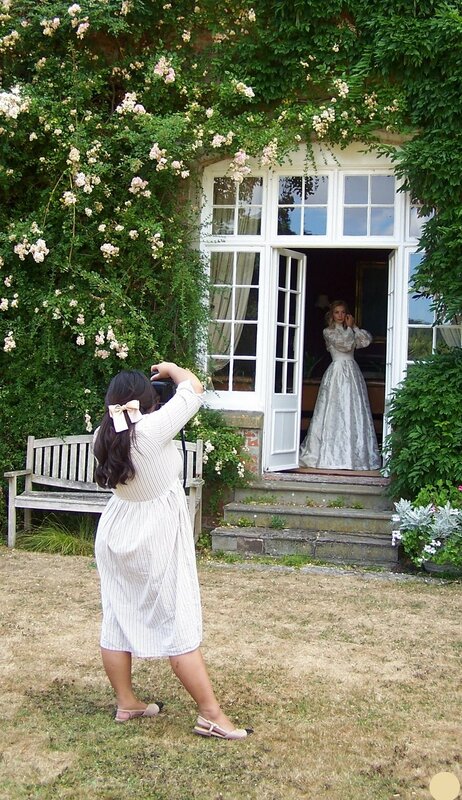 During the filming here they used some Shillingstone props - my grandmother's 1937 straw hat, her flower basket and Monty, my daughter's working cocker spaniel! And now for the real ones. One of the scenes that Mariel wanted to create was a fully laid table. Our weathered garden table and chairs were perfect and Emma and Victoria produced the props along with some of our plates. The result, placed in the long grass by the Ha-Ha, looked stunning. The shoot finished with some shots in the walled garden and by the big urn at the end of the White Walk. Once again Monty was included. We had enjoyed every moment of the day and felt very privileged to be included. Now we share the finished photographs with you. Once again our lovely neighbour in the village allowed us to take our bags of apples to her apple press and turn them into apple juice. A busy, sticky two hours resulted in two dozen bottles of delicious juice. The first week of June brought the Fire Brigade to Shillingstone House to the huge excitement of our grand-daughter and her friends. The wet winter had raised the water levels and the spring under the house had been working over-time and the cellar had filled with water. The Sturminster Newton Fire Brigade agreed to come and pump it out as part of a training exercise. Two engines were needed to give the length of hose required. Our thanks go to them. When taking photographs of the garden, I found this beautiful baby thrush just sitting quietly in the middle of a fern.